Back in my teens and early twenties, the only beauty products that interested me was makeup. There was just something about all the colours and the artistry in the application that captivated my attention. Since then, I've realized that my makeup application was being limited by its base, my skin. After delving into the world of skincare, I quickly discovered that not all products are created equal, and in some cases, I was paying more for attractive packaging and not for quality ingredients within them. Thankfully, I now know that I can rely on Skinn Cosmetics to provide products that are able to give my skin the tender loving care that it deserves! If you haven't already incorporated a retinol into your skincare routine to keep your skin looking young, or if you want to change up your products, look no further than the Pure Active Brightening & resurfacing Concentrate Enlightened Radiance Youth Capsules! This concentrate features a unique peptide derived from a pearl protein to brighten the look of your skin while the encapsulated retinol and custom blend of fruit extracts dramatically resurfaces and smoothes the skin to reduce the look of fine lines and wrinkles and improves uneven skin tone. The box contains twenty individually portioned applications so you can be confident you are using the appropriate amount of product every time. The concentrate is used daily in the evenings for five days in a row, and then you take a break for two days before starting up again in the next five days. I always have so much going on, so keeping up with what days to put n products or not is more of a mental step than I want to deal with, and Skinn makes it easy with the pre portioned tubes in convenient rows of five to follow along with the week. After using these Enlightened Radiance Youth Capsules for a full month, I am really loving it! I do like the smaller tubes particularly when it comes to traveling, and I can just toss the three of four mini-tubes I need in my bag for a quick trip rather than have to take a larger container through security at the airport. The only caveat to this is the waste. I really enjoy the product, and while I know smaller tubes keep ingredients fresher, I really dislike having to discard so much plastic, even if they are tiny little tubes. I would love for Skinn to release this in either one larger container or with packaging with a week's worth of products per tube to cut down on some of the waste. Until then, I'll likely purchase this and save the tubes for my travels and use another retinol product while I am home. Skinn Cosmetics has another retinol product coming soon in their Collagenesis line that has caught my attention so I'm planning to pick that up when it is available to try out. Fewer things feel better than supple skin that is silky smooth! Instead of a mask that is applied and then washed off after a period of time, the Fill Me In Line Filling & Volumizing Mask is meant to be applied to the skin with the included brush and left on your skin for maximum results. It is formulated with hyaluronic acid and an encapsulated amino acid to provide a deep hydrating boost to your skin as well as anti-aging benefits all while melting into your skin and filling in fine lines and wrinkles. I was initially concerned that this might be a little too heavy for both morning and evening use for me, but it couldn't be further from the truth. It absorbs beautifully into the skin, and I love how it helps to smooth my semi-textured skin before makeup application. I also like that Skinn included a brush with this product, although I am still prone to dip my freshly-washed fingers into my jar products. The brush feels really soft on the skin although you will need to stay on top of keeping it clean with constant washings so the product you place on your face is always fresh, not to mention the "gumming up" of the brush if it isn't cleaned. 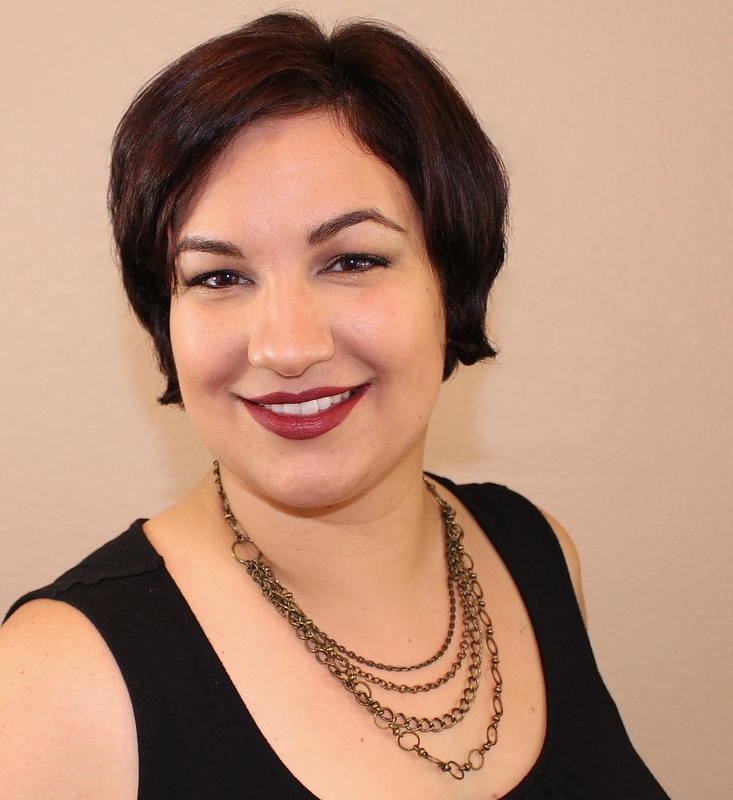 Often when people think of skin care, they often forget the décolletage. While your face may not show your age, the lines in your cleavage will give it away! Rest assured, even if you haven't taken care of this delicate skin, Skinn's Rich Protein & Probiotic Neck Armour Leave-On Neck Mask is here to take you out of your turtle necks and back to plunging necklines. Formulated with rice protein, a probiotic blend derived from jicama, and white truffle extract, this rich cream smoothes and hydrates your skin overnight while you are sleeping. Simply shower off in the morning to rinse and you will see impressive changes to your neck and chest quickly! I also like that this can be used in conjunction with other serum treatments to have you feeling va-va-voom even sooner! 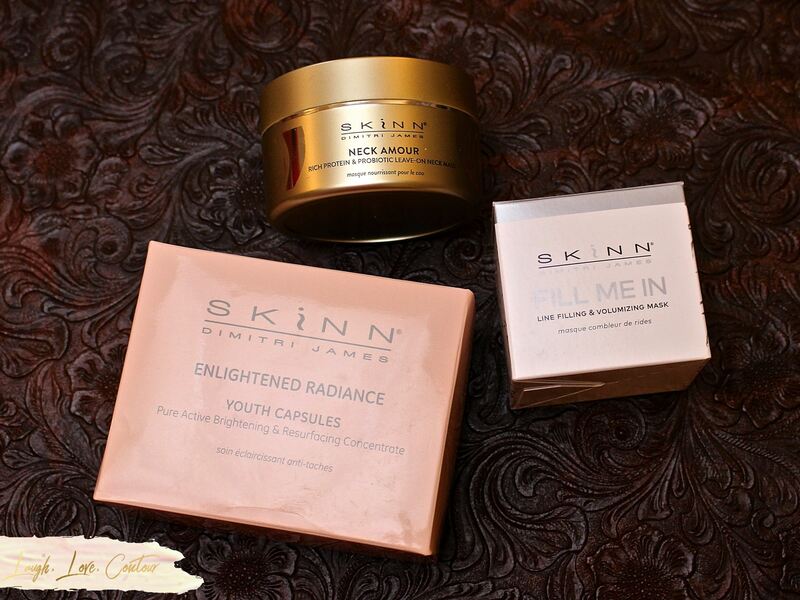 Skinn Cosmetics offers a fabulous assortment of quality products for your skin, and I feel confident with letting the brand filling my skin care needs. 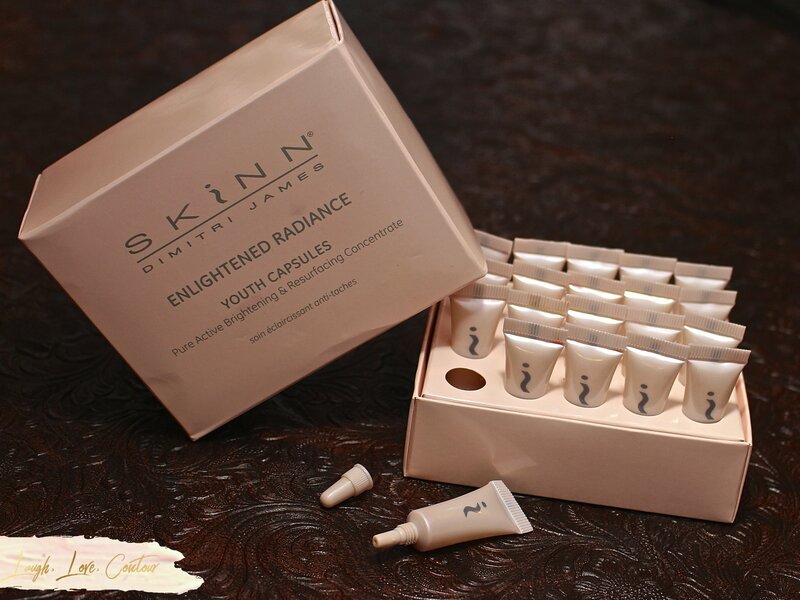 Whether your concerns are lines and wrinkles, lifting and firming, dull and dry skin, or just skin discoloration, Skinn Cosmetics offers a product for you. After my experience with these products, I know I'm eager to try out even more from the brand! What are your main skin concerns? Do you have any tried and true products from Skinn Cosmetics? I'd love to hear from you! Oh, how lucky and ignorant I was in my youth! I haven’t tried this brand but it sounds like it will meet my needs! These all sound like excellent products. The capsules are perfect because then I wouldn't skimp on the amount I use. I'm not able to use a retinol product for the next few months but I'd consider these after that. I just like fresh and clean skin. Always my goal. I agree, don't forget the decolletage, it reveals a woman's true age.... and hands too! This sound/looks nice! The brush is interesting, don't think I would think to use it for that product! I totally agree about the cleavage! Have to moisturize and protect it. I have totally been thinking about how my cleavage is looking "old" and has some wrinkles. Maybe I need a product like this. 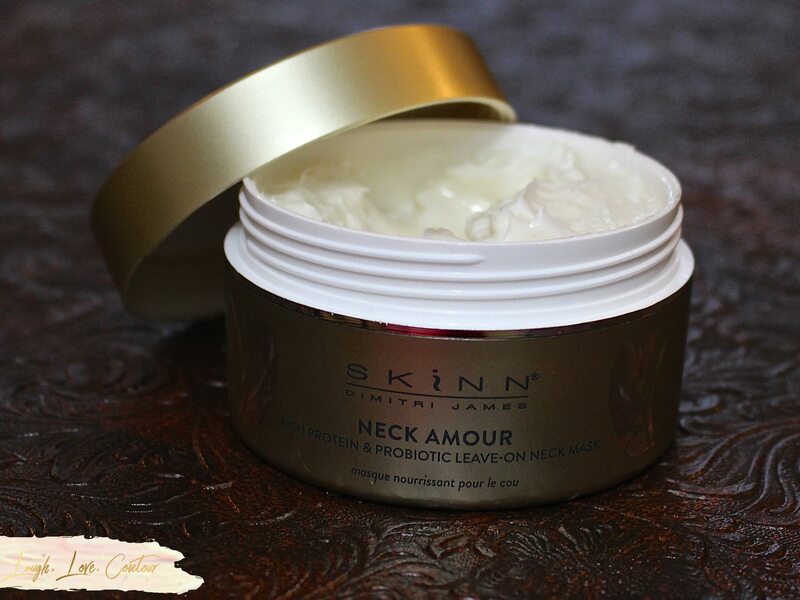 I first read neck amour as neck armor and though that it sounded like the most amazing product name ever for a neck cream! Regardless, it sounds like a great skin care product! It’s important to take care of all of our skin, not just face. I neglected skincare as well, until two years ago, when acne caught up with me. Now I find my neck has been neglected. Those capsules sound like a great serum; they're also ideal for travel. I've never heard of this brand before. It sounds fab!